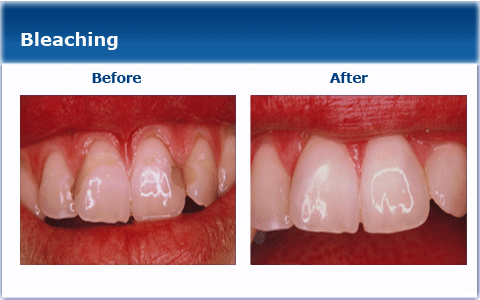 The use of “Home Bleaching” kits which can be worn during the night or day, enables nearly all patients to improve the colour and vitality of their smile. 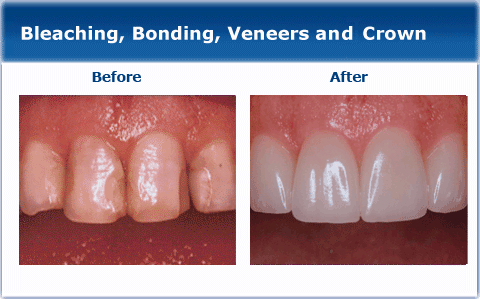 Bleaching is often used in combination with porcelain veneers and all porcelain crowns to lift the colour of adjacent teeth and create an overall smile improvement. 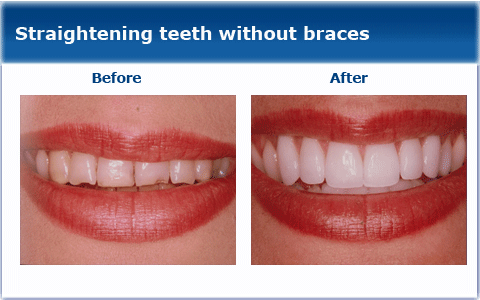 Bleaching system are very safe and have been accepted dental treatments since the 1970’s. 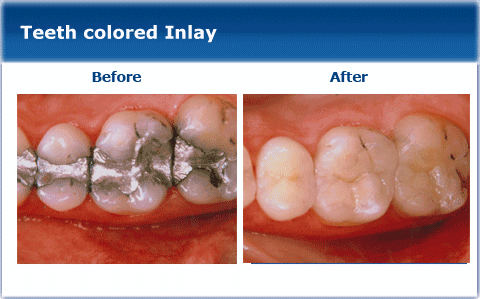 The older type of teeth coloured fillings have a life expectancy of about 5 years, because they are not polishable. They pick up stains from coffee, tea and even from smoking cigarettes. These fillings tend to discolour, and then start to leak at the end of their useful life, which leads to decay. Due to decay and refilling over the years, front teeth can become weakened, discoloured and at risk of breaking and tooth loss. 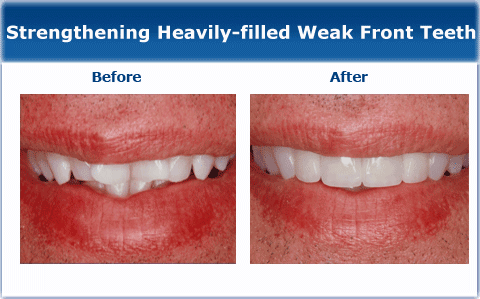 Using porcelain crowns, the strength of the teeth is restored and their appearance improved dramatically. This patient wore temporary ‘blueprint’ crowns for a 2-3 week period; enabling the patient to “test-drive” their new smile and to provide feedback to the dentist about the final result they desire. Traditionally, the only option for this patient would have been braces. Modern day procedures enable dentists to use porcelain veneers to straighten crowded teeth, lengthen short teeth and improve self-confidence with a brighter, fuller smile. Two visits were required for this amazing transformation and the patient wore “temporary veneers” to confirm the colour and length that created her new smile. Front teeth often wear down due to grinding from the stresses of modern day living. Most grinding and wear occurs at night when we are sleeping. This patient had porcelain veneers placed in combination with bleaching of the back teeth in order to rejuvenate her smile. 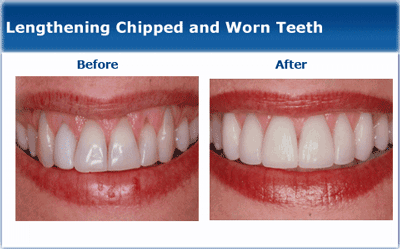 By wearing a slim fitted ‘night guard’, her new smile was protected from the damage of ongoing tooth grinding. This tooth coloured inlay can be fabricated in the laboratory or in the surgery by the use of CAD/CAM systems (CEREC restorations). 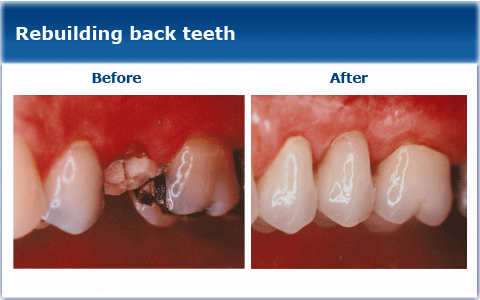 The replacement of silver fillings using porcelain inlays strengthens these teeth and protects them from the risk of breaking due to internal cracks commonly found under large silver fillings. The inlays are made in a laboratory over a 2-3 week period. During this time, the patient wears temporary inlays to protect the teeth whilst eating. This patient did not like the narrow gum lines at the neck of her teeth and the discoloured and worn appearance of her front teeth. 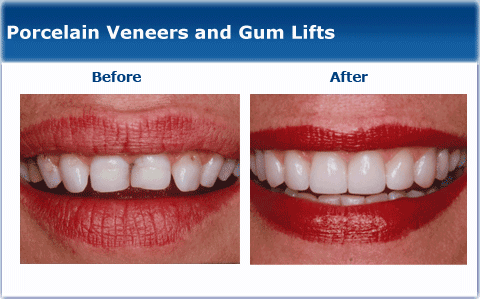 Utilising a gum lift, our dentists can reduce excessive gum display. In combination with porcelain veneers on the front teeth, this patient received a new smile that improved here self confidence dramatically. The rebuilding of back teeth using porcelain inlays strengthens these teeth as well as improving this patient’s smile when she laughs. The materials used include tooth coloured filling material for small fillings and porcelain inlays for the larger fillings, where strength is also a requirement. The inlays are made in a laboratory over a 2-3 week period; during this time the patient wears temporary inlays to protect the teeth.